In its shape and materials, this small tunic, created in the 17th century in Peru, follows the pattern of male garments created in the Andes for centuries. Woven of cotton and camelid fiber, the unku is open at the neck, arms and bottom, and would have covered its wearer from neck to knees. The combination of deep red and purple-blue comes from the skilled use of cochineal dyes indigenous to the Americas but also well known (and coveted) in Asia and Europe by this time. The unku measures less than 2 feet in length (ca. 0.5 m.) and was likely created for a saint’s statue, perhaps an image to be carried in procession. 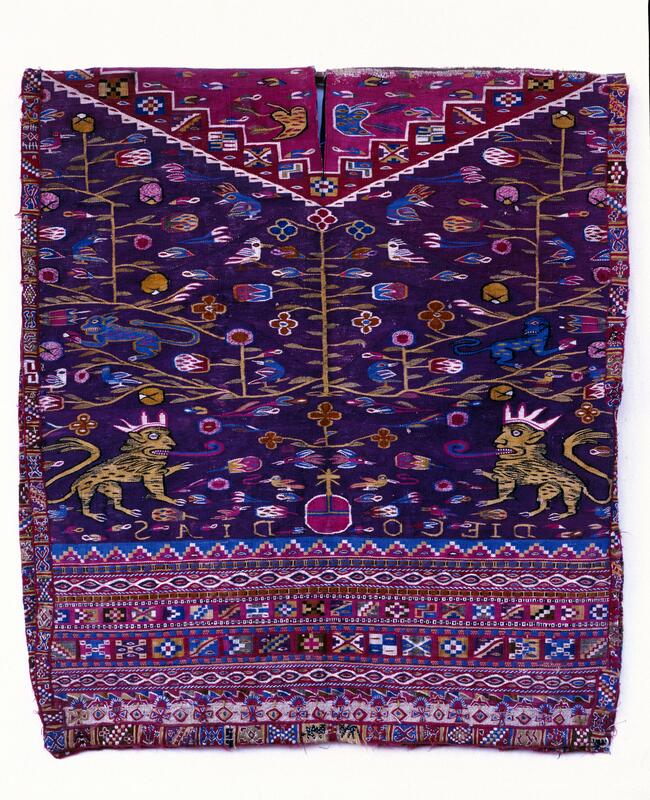 Its yoke, with its V-shape and geometric border, resembles elegant male unkus worn by elite Inka men, both before and after Spaniards arrived in Peru. 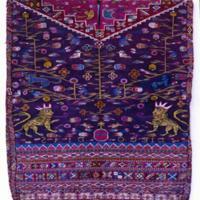 The central section of the unku has been woven with small birds, flowers and feline-like figures. The heraldic lions at bottom, shown here with long scrolling tongues and jaguar-like spots, were originally introduced to the Andes through Habsburg coats of arms. The orb and cross that is set between them are Christian symbols. Along the bottom border, the lettering spells out the name, Diego Dias, in reverse. The backwards lettering suggests the weaver may not have been able to read, yet understood the importance accorded alphabetic writing in indigenous communities in the 17th century. Below the text, the border of stacked squares, each filled with a geometric pattern, resembles pre-Hispanic Inka tocapu, as do the borders embroidered along the sides of the tunic. Neither the weaver’s name or that of the tunic’s original owner is known, although the “Diego Dias” woven into the garment may refer to its patron. This garment was woven on a loom of cotton and camelid fiber. In using a tapestry weave and embroidery on both sides (so that both inside and the outside of the tunic appear ‘finished,’), the weaver displayed high-level skills. The tunic measures 21.75 x 17.5 inches (ca. 55 x 44.5 cm) and, in an Andean context, would have been appropriate for a child or a statue of a saint (santo de vestir). For design inspiration, the weaver drew upon elements with indigenous Andean origins as well as those with Christian connotations—which would have been appropriate for a processional statue in a local church in the 17th century. Today the unku is in the Museo Inka in Cuzco; its original setting was most likely an Andean church, perhaps in Cuzco, where saints “de vestir” were (and still are) common. The production of this unku reveals the passing of deeply embedded weaving traditions of weaving across generations in the Andes. At the same time, the garment makes clear how long-standing practices—of spinning, weaving, dyeing and design—were far from static, but actively adapted in indigenous communities to serve Christian ideologies and practices in the 17th century.